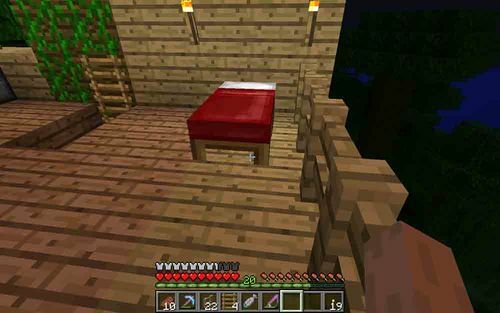 [[Image:Bed_screenshot.jpg|thumb|500px|right|Building a bed to avoid the night monsters.]] Congratulations, you've made it through the night! By the time the sun comes up on your second Minecraft day, you will likely be getting hungry. Your hunger status is shown on the right side of your screen as a series of ten drumsticks. As you get hungry the drumsticks start disappearing. Once your so hungry that all the drumsticks are gone, your health, shown on the left as ten hearts, will start to decrease. It's time to start finding some food.